Enjoy an enchanting Christmas Day exploring some of southern England’s highlights — all wonderfully crowd-free due to the festivities — on this full-day tour from London. Traveling by air-conditioned coach, visit historical Windsor to see landmarks such as Windsor Castle, and savor a traditional 2-course English Christmas lunch. Then, admire views of UNESCO-listed, prehistoric Stonehenge and visit the half-timbered village of Lacock, a setting used in two Harry Potter movies. Lastly, call at the sublime spa city of Bath to see its handsome Georgian architecture, including the Royal Crescent and Pulteney Bridge. Enjoy a Christmas Day lunch and a visit to Lacock—where Harry Potter was filmed. On Christmas Day, depart an uncharacteristically tranquil London by air-conditioned coach and journey west to the historical town of Windsor. With the roads free of normal traffic, absorb the unspoiled views of England’s countryside and complete the journey to Windsor in much less time than usual. On arrival, take a walking tour, including a fascinating stroll around the perimeter of Windsor Castle, the 1,000-year-old fortress still used by Her Majesty Queen Elizabeth II. Delve into the cobbled streets and pass the house lived in by William Shakespeare when he wrote his play, The Merry Wives of Windsor. Pass Windsor Guildhall, and make your way to the Long Walk in Windsor Great Park to enjoy sweeping views over the castle’s towers. Next, cross the bridge to view Eton College, the elite school founded in 1440 that was attended by Princes William and Harry. Then, after your walk, sit down to a traditional, 2-course English Christmas lunch at a nearby hotel. Savor delicious roast turkey with all the trimmings followed by rich Christmas pudding. If you wish, raise a glass of wine or other alcoholic drink (own expense) to celebrate the occasion. Back aboard your coach, drive to Stonehenge, the world-famous prehistoric monument set on Salisbury Plain. 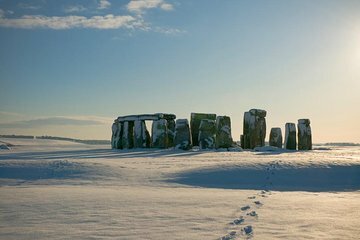 The site is closed every Christmas Day, so stop to absorb stunning views of the UNESCO-listed stone circle from the plain itself. Hear the mysteries of this 4,500-year-old edifice from your guide, and ponder how the stones were transported here as you snap photos. Next, continue to Lacock, a 13th-century village that’s one of the prettiest in England. Stretch your legs around the half-timbered cottages, and learn how this quaint place starred in famous movies such as Harry Potter and the Half-Blood Prince and Harry Potter and the Philosopher’s Stone. Lastly, head to the Georgian spa city of Bath, one of England’s architectural showstoppers. Enjoy a coach and short walking tour around the honey-colored buildings, including the Royal Crescent, and then finish your tour in central London in the early evening.